into the price of used ones (if you can find any in your area)and was surprised how inexpensive they are! 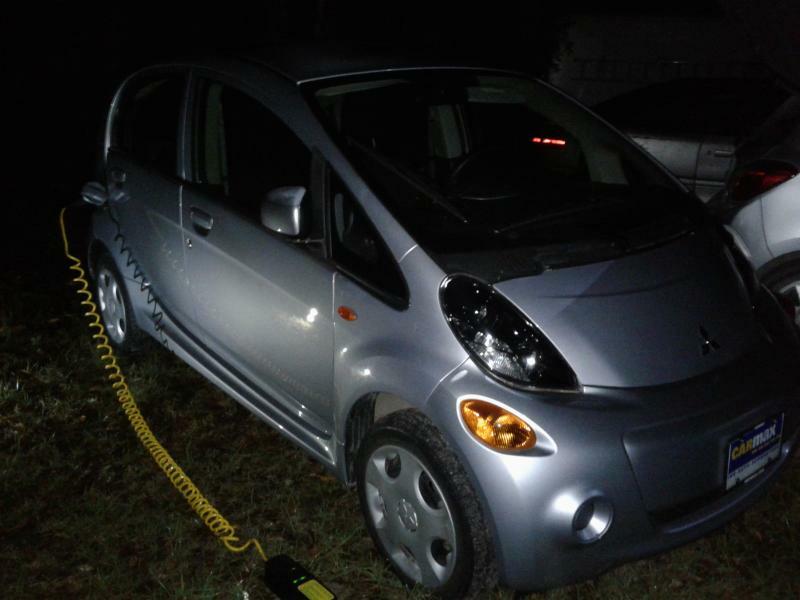 Long story short a week ago I traded my 99 B4000 truck that's been our backup vehicle and got a Mitsu i-miev! 2012 with 15150 miles. $7500. My dream was to convert a gas car one day but honestly you can't buy the parts for that amount of money plus all the work,machining etc. I still keep my (gas hog ) Mirage for longer trips and to use with the trailer when needed but at the mean time use the macho i-miev for my 28 mile commute to work. It can make that commute using 5 segments of 16 total on the state of charge gauge (16 Kwh pack),dropping the fifth segment within 1/4 mile of my destination. I put 500 miles on it sofar and really like it. 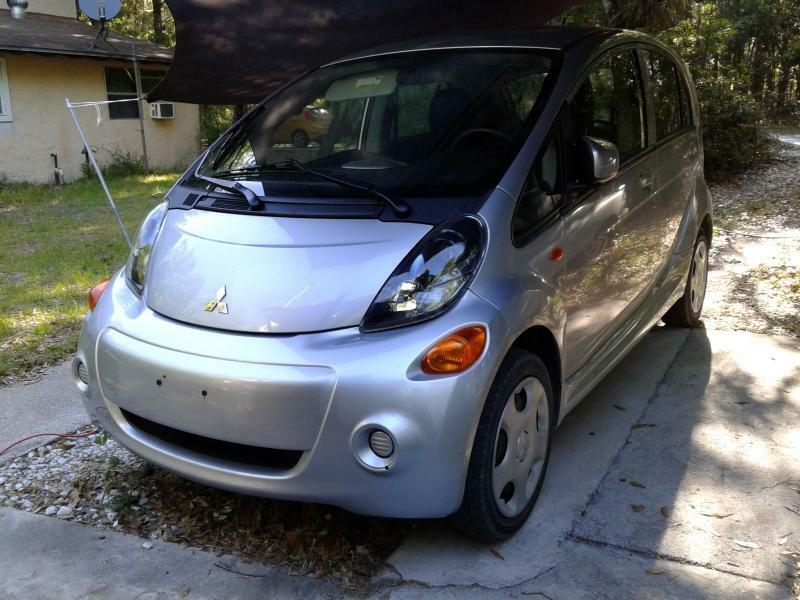 I wanted the i-miev (for it's looks ) over other EVs for it's simplicity and utility! I've been getting 300+ lbs of concrete in bags with it and it does not even know it's back there. Rear springs are pretty stiff. Very hypermilable! It has an actual shifter with a real cable going back to a lever on the rear single reduction gearing that provides forward,neutral and reverse! You can bump it in neutral at any speed (to avoid regenerative braking) and back to D, the shift is instantaneous and silent which makes it hard to believe for me that it actually goes in neutral as it is indicated in some i-miev training material from Mitsubishi. But it coast so well that I have to believe it. Then when it's time to come to a stop,bump it down to D,one more down to Eco for more aggressive regen,one more down to B for more and then touch the brake pedal to pour on all the regen. Mine is an ES which is the base model without the bad boy quick charger on the left fuel door. All I have is a basic level 1 (110V) charger with a low (8 Amp) setting and a higher (12 A) setting to use on the right side regular charging port. On low it charges about 1.5 hours per segment gained on the charge gauge and on the higher setting it takes about an hour to gain a segment of charge on the gauge. I don't know what level 2 charging (220V) can do because out of the 3 Eaton level 2 chargers at work...none works. Two has a solid lit red wrench symbol (had not even tried these) and the one on our side gets the red wrench flashing rapidly immediately after plugging in. I figured out how to reset the charger but no use since the wrench symbol comes on flashing as soon as I plug the car in. No biggie,I'm in no hurry to charge. On the road: The i-miev might be the most wind sensitive car out there as far as being tossed around side to side. Unless it's just mine doing it. I checked alignment and it did need the front toe to be brought in to specs (was spread out) but did not change much. Also seems to be sensitive to ruts in the road (again darting left to right) despite the bicycle tires up front. Usually cars with wide tires suffer from this like corvettes. Don't bother me too much just comparing to my Mirage. It seems quick when you put your foot into it. I had a couple scenarios when you decide to go for that green light no matter what color it's going to be when you cross it (within reason)and I literally flew over the hump in the intersection not realizing the speed it gained getting up to it. I also LOVE the hate and looks I'm getting form (possibly insecure)people. Guys will say it's ugly and they would like the economy but they hate the car lol! That's cool! If you feel comfortable spending 3/4 of your paycheck to feed the monster truck,keep doing it! Someone said "But it only has a 60 mile range!!!" -So you're saying I can drive it to work and back home without charging in between if I need to?-Cool! I had two big pickup trucks blocking the right lane at a traffic light so I had to line up in the left lane.When the light turned green I shot out leaving them so I can get in "my" slow lane in front of them and when they finally came around me on the left,the lady on the passenger side literally had her nose stuck to the window and her lips were moving checking out the weird little i-miev. Like she just saw an alien space craft floating along. THAT put my EV grin on! Btw when I get in it in the morning, the range remaining (RR) display usually says around 86 miles left,but I've seen it say as high as 91 miles RR. So plenty for me most of the time. While I didn't take the complete plunge and end up going with a full EV, I rarely use any gas in my Volt. I drive it in EV mode almost 40 miles a day, plug it in at night to a regular wall outlet (which takes seconds) and just unplug and go in the morning. It felt pretty good saying goodbye to gas even though I was previously driving a G1 Insight that was getting 70 mpg, so I know it has to feel great to go from a truck to an EV! Congrats on the iMiev! I've had my eye on them for a while and its quite possible one will eventually take the place of the Insight. Just waiting for the right deal to roll along. Lucky you though! I'd love to hear more about it and if there are any mods you plan on doing. Welcome to the EV world! Next time you have a load to haul, leave the truck and the trailer at home. Besides those concrete bags, you could fit two 55 gallon barrels in the back, a 50" TV, or most adult bicycles (front wheel removed). PS- Its par for the course that your dealership hasn't maintained its charging stations... Mitsu has been EVen worse than Nissan in that regard. Have driven over 100,000 all-electric miles! Beauty is "...in the eye of the beer holder...", so sometimes you just gotta grab another beer...or...grab your sunglasses (wink,wink). Thank you! Well,it was not really a lucky thing. There were cheaper ones to be found listed for sale but all at a great distance from me. I also did not want a dark colored one. White or silver is good in FL. It has two coolant systems. One in the front for the heater with it's own reservoir and one in the back for the motor,controller,charger maybe? With it's own separate reservoir. The radiator is up front so a little airflow might be a good idea. When plugged in to charge,it immediately turns on the battery blower fan for a couple of seconds to test, then after that during charging I can hear a coolant pump coming on periodically for a few seconds. I guess the charger must be liquid cooled? I'm still learning about this thing. Thanks Jay! I think the range estimate on the display depends on how it was driven before it got parked to charge it. If I abort the charging with two segments missing from full,mine will still show 70+ miles RR. I walked up to a LEAF on a lot to take a peek and when I looked through the drivers window and saw the shifter being a little electronic looking joystick I kinda got turned off thinking this thing is not going to let me be in control. Could be wrong about it but then I knew I want the i-miev. Yeah there are cheaper ones too. Just google "used i-miev" and check out all the car sites that come up with the listings. I kept my Mirage too for the longer trips and for hauling bulky items on the trailer.